WOMEN of the Woking & District (SIWD) and Weybridge branches of Soroptimist International struck a pose and produced a superlative example of that great British institution, the afternoon tea, to raise more than £1,500 for women in Kenya. 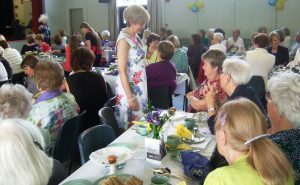 ‘Tea and Temptations’ brought together members and guests in a packed Ripley Vill-age Hall for an assortment of homemade sandwiches, scones and cakes on beautifully decorated tables – all offered at a smidgen of the cost of famous London tea rooms. Meanwhile, the fashion show saw models from both clubs working the stage and walking through the hall with great poise and style. The clothes were supplied by Betty and Claude of Chobham, Mad Jak of Shere and Phase Eight of Weybridge. Outfits ranged from casual wear through to more formal wear with some of the models sporting rather fancy hats – a perfect fit for a day at the races, and with summer upon us who could resist? There was also an opportunity to buy Mad Jak clothing, plus ‘Simply Send’ textile products from Send Women’s Prison (raising £185 for HMP Send), WOW bags made from recycled drinks cartons by a charity in the Philippines, handbags from Flutterby Chic and jewellery from Just Jewellery + Things. The event, together with a raffle raised £1,555, which SIWD officials say will make a huge difference to women, their families and communities in Meru County, Kenya. The Meru Women’s Garden Project will be supported by Soroptimist International clubs across the UK over the next three years, in collaboration with child.org. The project will help some of the poorest women-led households in Kenya with no other chance of making an income. In Meru County, there are high rates of malnourishment, poor farming techniques and low rates of literacy and numeracy. The project will address these problems by providing training in sustainable gardening techniques and tools, enabling women to grow their own crops and to help others to achieve agricultural sustainability. It also aims to empower women and girls to have a voice in their community, encouraging them to stand up to damaging cultural practices like female genital mutilation.